Restored on 2 LP set. 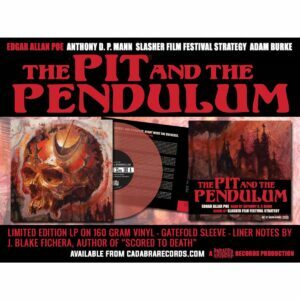 Now available on premium 2-LP set! Fully restored, complete Jerry Goldsmith soundtrack from Steve Miner satanic horror film with Julian Sands, Lori Singer, Richard E. Grant. When Goldsmith first prepared his 1989 album (on both LP and CD) for Intrada, he omitted numerous cues, dropped several electronic ideas and deleted sweetener tracks. Resulting original stereo mixes were all that existed for some 25 years. Now, at long last, newly located 2″ masters allow restoration of the entire score with all electronics and sweeteners intact plus many previously unreleased cues! Warlock holds a very important place in the composer’s repertoire: Coming literally at the end of the eighties, Goldsmith bids farewell to his legendary busy action vernacular while simultaneously looking forward to his streamlined nineties work. Meld of two styles is terrific! Lean main theme in minor key trades with aggressive action spotlighting propulsive low brass figures, swirling woodwinds, slicing strings. Epic highlights: lengthy final showdown (“Salt Water Attack”) with dynamic action writing, heartfelt parting sequence (“The Salt Flats”) with rich variant of main theme, moving chordal passages. Vibrant mixes made by Bruce Botnick & Mike Matessino, entire production supervised by Nick Redman, notes by Jeff Bond, vinyl mastering by George Horn at Fantasy Studios. 2-LP set with 180 gram premium vinyl pressings contained in deluxe gatefold jacket designed by Joe Sikoryak with shiny UV coated surface, full artwork title on spine, full color throughout, all housed in loose polywrap with gold foil sticker. Score recorded in Australia during August 1988. Jerry Goldsmith conducts Victorian Philharmonic Orchestra. Intrada special limited edition 2-LP vinyl presentation!